There’s a new store at the 3rd Level of Robinsons Galleria that caught my eye. It sells twisted candies and lollipops. I knew I had to buy something from this candy store, and I ended up getting these lovely lollies after Christmas. These were perfect giveaways to the kids and the kids-at-heart in church. Of course, the first taster of these colorful lollipops was my 6-year-old son. 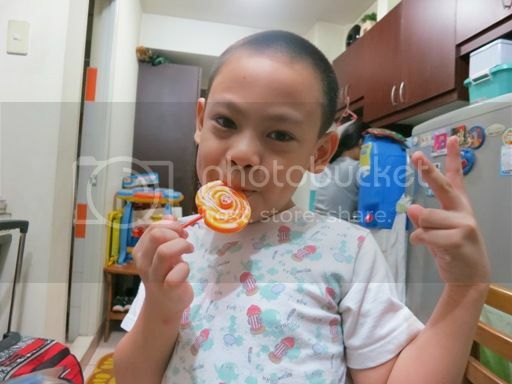 He had a hard time deciding which lollipop to open; he finally chose this orange lolly which he really enjoyed. Because this lollipop is big, it took so long to finish it. Next time, I’ll buy some of their twisted candies. This entry was posted in Lollipop, Robinsons Galleria, Twisted Candy. Bookmark the permalink.